Jockey Richie McGrath, ex-trainer Kate Walton and five others have been charged with breaching betting rules by the British Horseracing Authority. The allegations relate to use of inside information on the likely performance of horses in 57 races held between between October 2009 and April 2012. Mark Aspey, Carl Flint, David Stevens, Kristian Robson and David Greenwood were named as the others involved. A BHA hearing has been provisionally scheduled for 11 November. 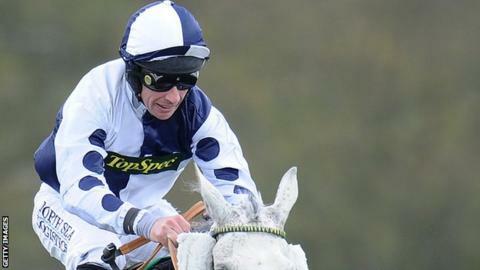 If found guilty, a ban from the sport of up to 10 years could be issued. Scottish Grand National-winning jockey McGrath and Walton are alleged to have conspired with Aspey, Flint, Stevens, Robson and Greenwood in breach of Rule (A) 41.2 by committing "a corrupt or fraudulent practice". "Richie is shocked and bitterly disappointed to be facing charges." A BHA statement said information that was not in the public domain was used to gain an unfair advantage in the betting market. It also alleged McGrath was prepared, if necessary, to "omit to ride the horse on its merits so as to prevent it from winning or being placed in the race". Walton is also charged with "encouraging or causing one or more others" to place bets on Rumble Of Thunder when they were prohibited from doing so. McGrath's solicitor Andrew Chalk said the rider, who is a board member at the Professional Jockeys Association but has not ridden this season, denied the charges. "Richie is shocked and bitterly disappointed to be facing charges, but vigorously maintains his innocence and intends to fight to clear his name, however financially straining that may be," Chalk said. "Richie has informed the Professional Jockeys Association that, whilst he fights to clear his name, he will temporarily stand down as a board member of the PJA."